This mod adds two items, one of them are Cloud Boots from Chocolatin's Mod called "Chocolate Quest"
Unfortunately, Chocolate Quest mod wasn't updated since 2015, so I made these for the latest version of Minecraft! There's no big difference between boots. 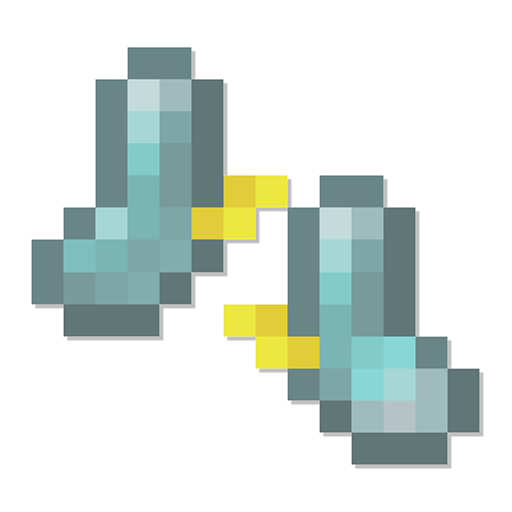 - cloud boots now can be repaired with gold ingot. - Added particles when jumping. - Changed acceleration in air, so jumping is much better. - Golden feather negates fall damage, when holding in hand. - Cloud boots and golden feather. Better dungeons are available on 1.7.10 and I think you could craft them someway. I suggest diamond boots in the center of the recipe. Sorry, but I won't do that, because I want to keep mod very similiar to Chocolatin's one. Oks, would there be some form of forced landing in combat? Something like an air strike. Hi. great mod thanks you! But I need to ask... I don't understand one of the last changes, "added durability to golden feather, golden feather can be repaired in anvil with gold ingot" Just why? I mean, I have not find golden feathers anywhere, are you planning to add broken g. feathers to loot tables or something like that? You can add it to the list to stack almost any items, i use it. I have a zh_CN.lang file. Can the author's email address give me a private message? Can you make a mod with Chocolate Quest spawners?